Here's a shot from the Fiery Furnace; my favorite part of Arches National Park. 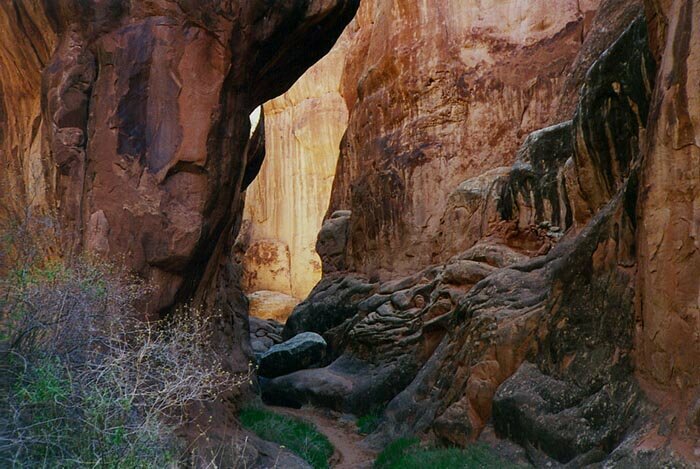 Entry permits are required to hike into the Fiery Furnace. To acquire a permit you pay a small fee and watch a short video while you learn how not to disturb the fragile environment here. Ranger-guided tours are available and recommended. It's easy to get lost if you go without a guide. Click here to view a 360° QuickTime panorama from this spot.